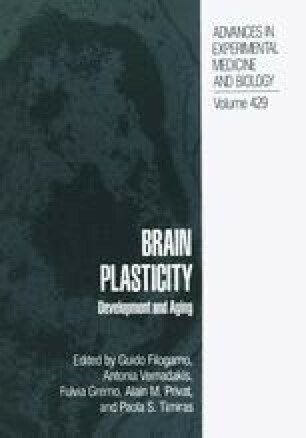 During development in vivo and in vitro, estrogens: a) increase brain excitability, particularly in limbic structures; b) are responsible for the maturation and cyclicity of limbic-hypothalamic interrelations; c) enhance myelinogenesis; and d) may act with NGF to stimulate neurite formation. In senescence, estrogen administration would improve memory in postmenopausal women. The absence or low levels of estrogens after menopause would increase prevalence of Alzheimer’s dementia (AD) more in women than men, irrespective of age or ethnicity. In the present study, addition of 17-B estradiol to cultured human neuroblastoma cells affected growth slightly, but stimulated cell maturation as shown by increased tyrosine hydroxylase activity. The extracellular deposition in brain tissue and around blood vessels of the amyloid ß-peptide (Aß), a 4.3 kD fragment of the larger integral membrane protein, ß-amyloid precursor protein (ß-APP), is considered an important characteristic of AD. We investigated whether 17-ß estradiol may influence the formation of the Aß (thus the abnormal accumulation of amyloid proteins) in neuroblastoma cells and in a B-APP transfected human kidney 293 cell line. Two doses of 17 ß-estradiol were added to the cultures of both cell lines. Cells were grown until confluence, metabolically labeled with 35S-methionine, immunoprecipitated with the rabbit antiserum R1282, gel electrophoresed and autoradiographed in order to compare levels of Aß under the different estradiol concentrations. While in neuroblastoma cells, levels of Aß were only slightly reduced after estradiol and a dose-effect relationship with the hormone could not be demonstrated, in the 293 cells, Aß band intensity decreased as concentration of estradiol increased. These data support the role of estrogen in normal and abnormal brain metabolism and suggest potential hormonal interventions which may reduce or prevent the formation of amyloid deposits that occur in AD.